for all students ages 4-12. Beginners welcome! Join us for a summer of unforgettable fun making music! CALL 661-253-9262 TODAY TO RESERVE YOUR SPOT OR SIGN UP USING THE LINKS BELOW! ***Tuition of $249 is required to reserve your spot. But if your plans change, we can move you to a different camp session, or we can refund 50% of your paid tuition if you let us know BEFORE the scheduled camp begins. Have the best week of your summer singing your heart out at our Singing Camps! 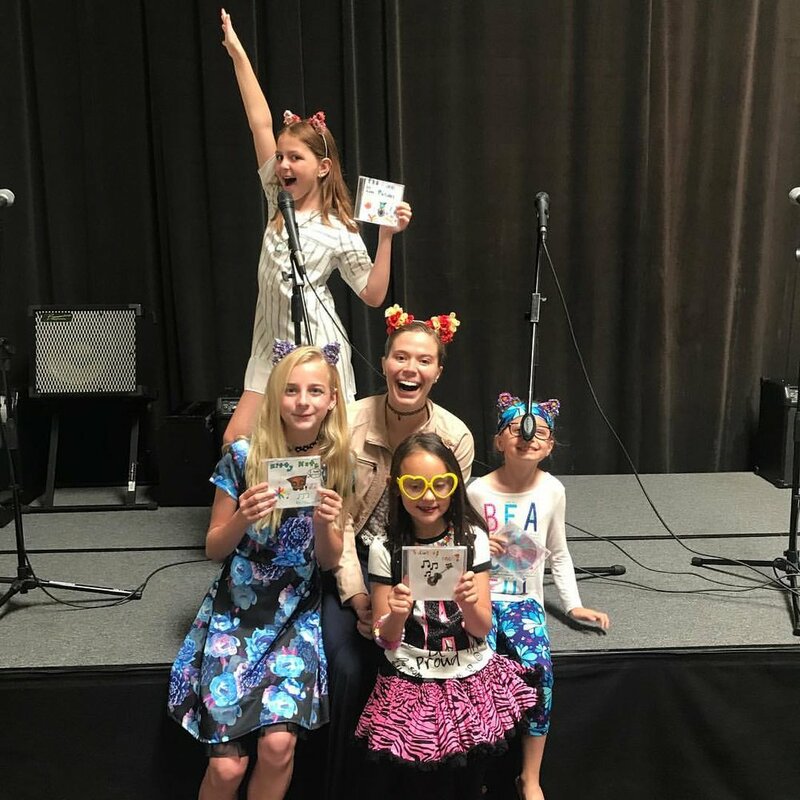 What to expect: Our singing camps are 15 hours of vocal instruction that feels more like having fun with friends than it does practice. Throughout the week, the students will sing arrangements of fun, popular songs while working on technique, harmonization, and blending in with other singers all while getting ready to put on an end of week performance in front of family and friends! At the end of the week, the students will feel more confident about their singing and have memories to last a lifetime. Who can sign up? We welcome beginners ages 7-12! Attend one or more weeks! The perfect camp for young beginners! What to expect: Have a blast and make new friends this summer in our Music Discovery Camp! Campers will play musical games for three hours each day while learning about note reading, rhythms, and musical instruments such as piano, guitar/ukulele, violin, drums, and voice/singing. Every day a professional musician will perform LIVE for the campers and INSPIRE them! In addition, there will be a kid-friendly daily workshop in which campers will get to interact with the different instruments being featured that day! Who can sign up for this camp? Beginners and students with no experience! What could be more FUN that a week of uke jammin'? What to expect: You don't need any experience playing the ukulele to join this camp. You don't even need to have a ukulele because we are giving every Jammin' Camper a brand new Ukulele on the first day of camp! After you learn the basics of how to hold and strum your new uke, you will begin learning how to play classic ukulele hits like "Somewhere Over the Rainbow", "Aloha Oi", "La Bomba", "Jamaican Farewell", and MORE! Campers will also get to perform in front of family and friends to show off what they've learned at the end of camp! Capture the Hawaiian spirit this summer at West Coast Music Academy! Who can sign up for this camp? Students of all levels are welcome!